I started watching Doctor Who (the 2005 series) sometime during the 12th Doctor's run (and was caught up before it ended), so the regeneration from the 12th to the 13th Doctor was the first one I got to watch "as it happened". What surprised me was that the person playing the role of the 13th Doctor was revealed via a pre-produced video on the BBC Youtube channel (spoilers, obviously). This surprised me because I had previously seen that the 12th Doctor was ceremoniously revealed in a live talk show (also spoilers, I guess? ), and I had just kind of assumed that it was done this way every time, or at least ever since the reboot. 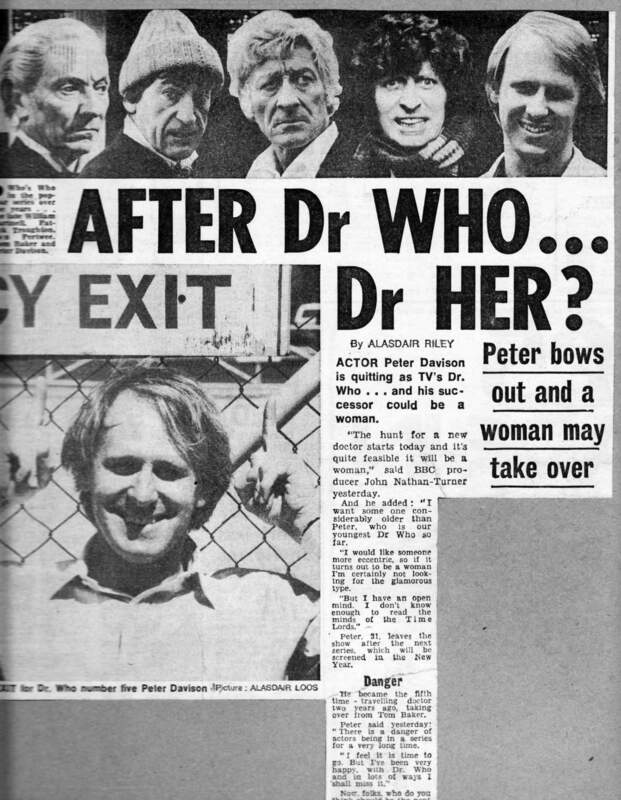 Out of curiosity, I tried to find footage of the earlier Doctors' reveals, but wasn't successful in my search. How were the next Doctor's actors announced in the past? Was it even as big of a deal as it is now? 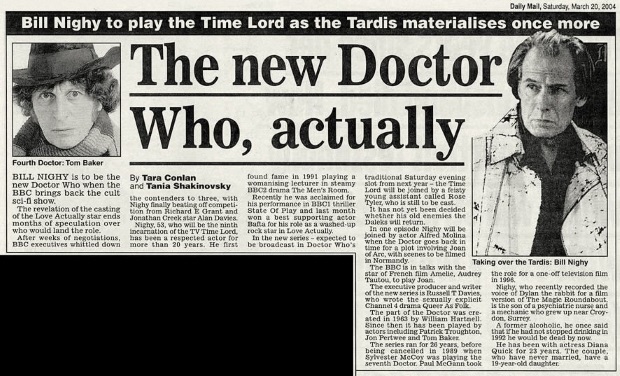 I'm especially curious about early on in the classic series when the very idea of a regeneration was still new, and if there has ever been a "surprise regeneration", where a new Doctor appeared on screen before the public even new there was about to be one. 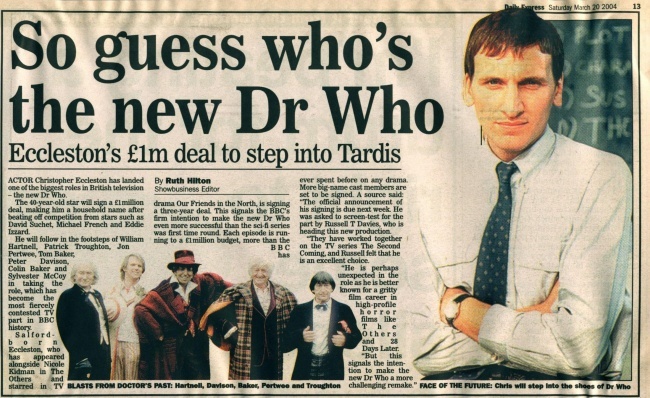 The identity of the new Doctor has always been newsworthy, it's only with the new series that they've been made into true media events (such as the worldwide live broadcast for the announcement of Peter Capaldi in the role). Now it's seen as being on par with the re-casting of James Bond, both getting bookies declaring odds for various actors. 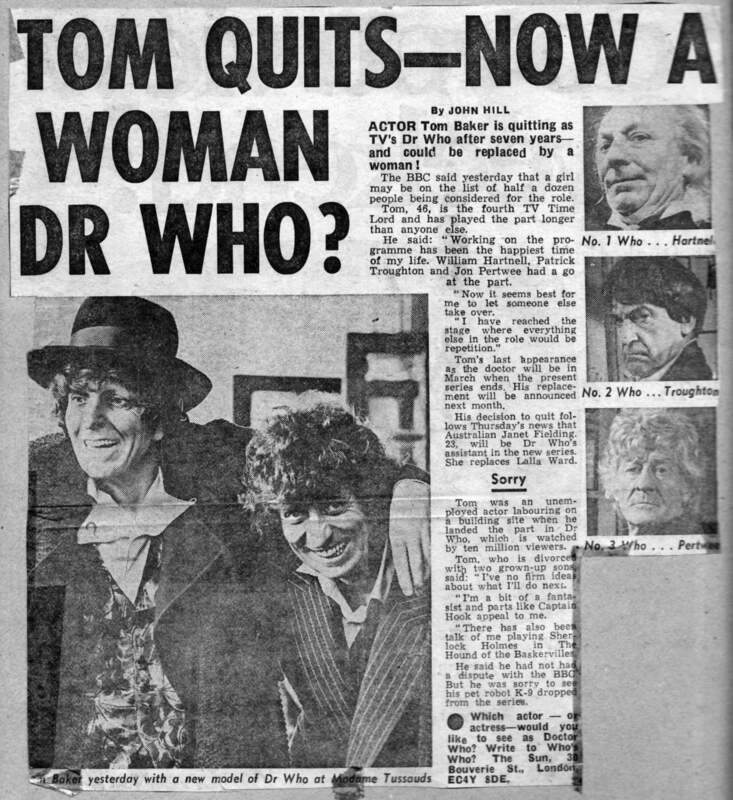 The news that Troughton was taking over for Hartnell barely got an inch in the British papers. Along with the new of the new actor, the requisite "What if they cast a woman?" 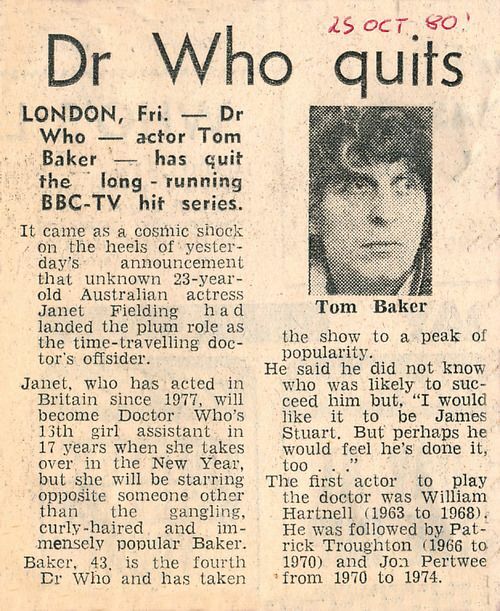 thinkpieces started popping up as Tom Baker's run was ending. The number of times they were titled "Nurse Who?" is too depressing a number to calculate with any precision. Here is the first "will it be a woman?" article as Baker departs. Bill Nighy was mistakenly announced to be the 9th Doctor. Hurt's retroactive addition to the list of Doctors was the only time there was ever a true surprise about the new Doctors. His regeneration to and from both appeared after this first appearance in Name of the Doctor. They did an amazing job of keeping this secret - review copies of the episode were missing this last four minute sequence. Capaldi's first appearance as The Doctor was in the 50th anniversary episode Day of the Doctor, before his regeneration. As with Hurt, it was kept strictly secret. Jodie's announcement was made via a special clip premiered on the BBC website. As far as I have heard, the first regeneration was a big surprise to the audience, since the Doctor had never regenerated before. But it would take a more knowledgeable Who fan to say for certain. The first regeneration happened early in the fourth season (or series as seasons are called in Britain), at the end of the fourth and last episode of "The Tenth Planet" (the first Cyberman serial) on 29 October 1966. 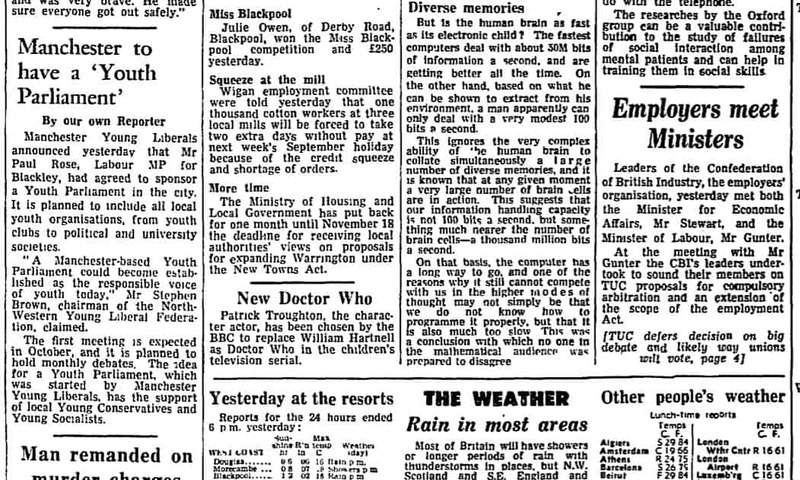 Patrick Troughton's first scenes as the new Doctor were in the first episode of the next serial "The Power of the Daleks" on 5 November 1966. I'm sure that there were brief notices in trade magazines, etc. that Patrick Troughton had been hired to replace William Hartnell as the Doctor for the fourth season. But I don't know how likely it was that ordinary fans would have heard anything about it or known when it would be shown. For thousands and millions of uninformed and unsuspecting children, the Doctor's first regeneration must have been a big surprise. I think that they might have been the second most surprised group of child TV watchers in all of history. All the other regenerations were at the end of the last episode of the last serial of a season. Since it was quite possible that the new Doctor hadn't been hired yet, the face of the new doctor usually wasn't seen. 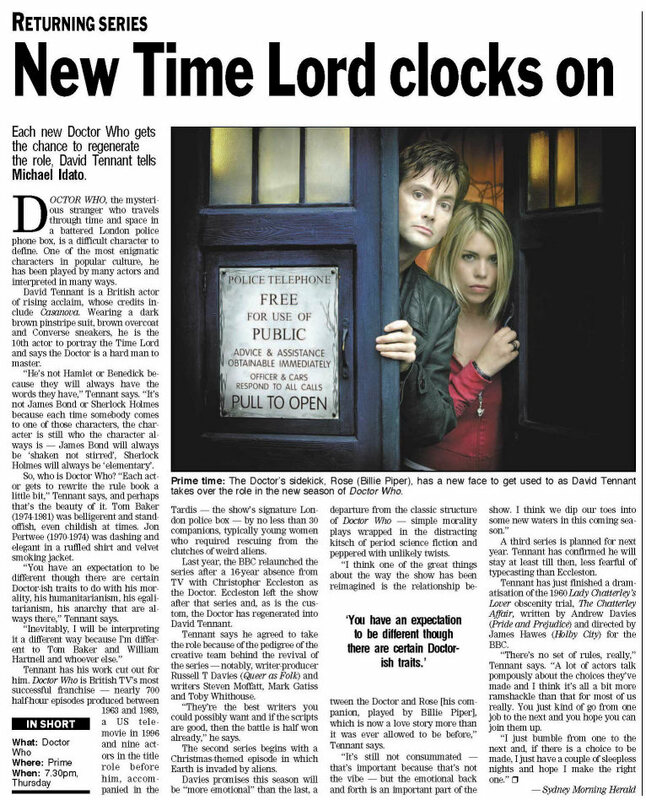 Months later that episode would be broadcast, and then the fans would have months to wait for the first episode with the new Doctor. They would probably hear who the new Doctor was before his first episode, though. There was one exception. 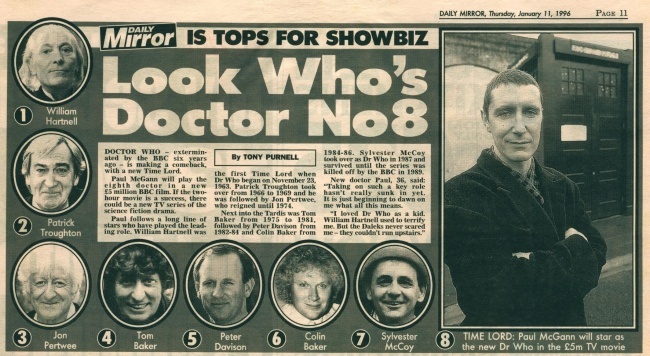 The decision to replace the 6th Doctor, Colin Baker, with the 7th Doctor, Sylvester McCoy, was made after the last episode of the 23rd season was filmed. Thus the first scene of the first episode of the first serial in the 24th season, "Time and the Rani", showed the regeneration, with McCoy portraying both the 6th and 7th Doctors in different makeup and costume. 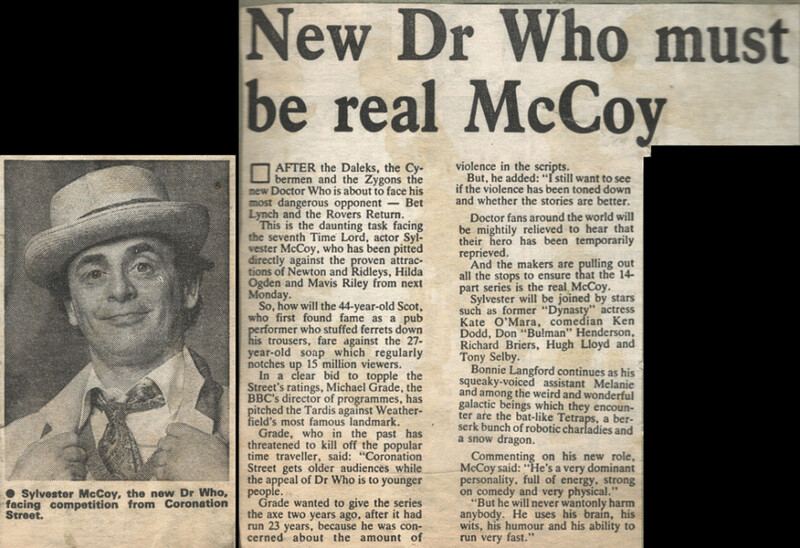 The replacement of Baker by McCoy would have been announced before the episode was broadcast, of course. 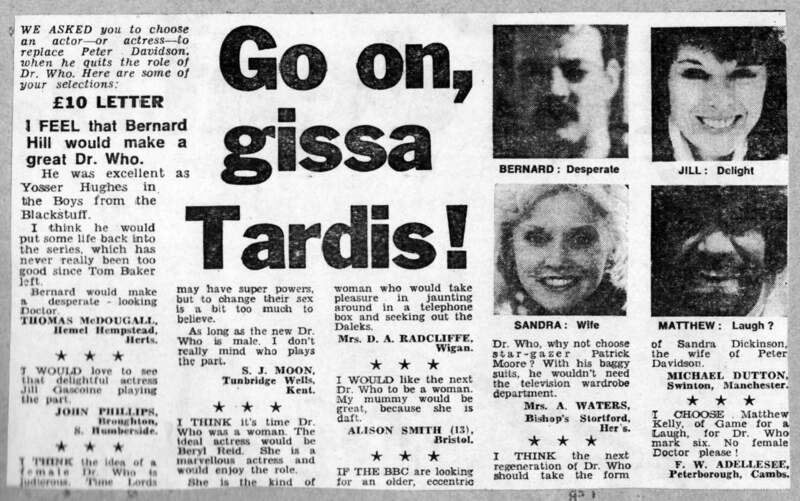 I suspect that a few persons on this site are British and old enough to have watched Dr. Who since 1963, so I trust they will correct any mistakes I made. Not the answer you're looking for? Browse other questions tagged doctor-who behind-the-scenes regeneration or ask your own question. Do Daleks have their own language? Has there ever been a Dalek civil war? What happens to Fixed Points if the past is rewritten? What were the effects of the Great Time War on the universe? 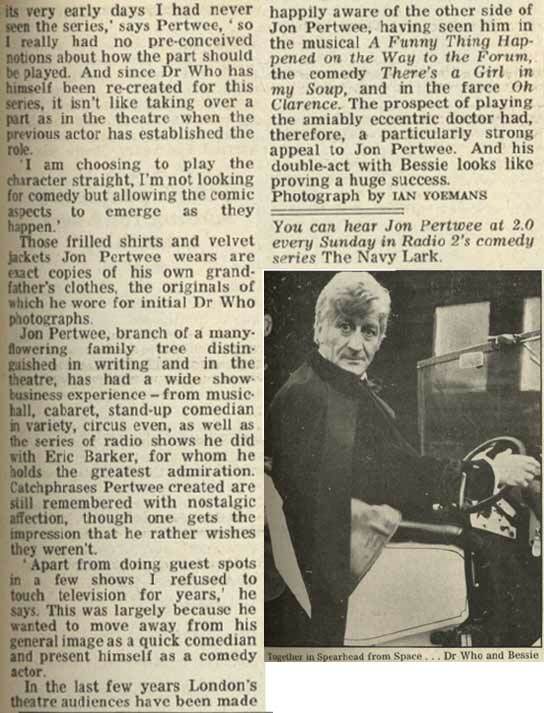 Why wasn't the Second Doctor's regeneration shown on screen?